The UK's former foreign secretary Lord Owen has revealed he suggested assassinating Idi Amin when he was in government. The former Ugandan dictator died of multiple organ failure in hospital in Jeddah, Saudi Arabia on Saturday. Lord Owen, speaking on Radio 4's PM programme, said his proposal was seen as an outrageous suggestion. "I'm not ashamed of considering it, because his regime goes down in the scale of Pol Pot as one of the worst of all African regimes," Lord Owen said. Amin, who was variously described as 78 or 80 years old, had been in a coma at King Faisal Specialist Hospital in the Red Sea port city of Jeddah since 18 July. "I looked seriously at the question [of assassination]"
He was forced from power in Uganda in 1979 by Tanzanian troops and Ugandan exiles, after one of the bloodiest rules in African history. Up to 400,000 people are believed to have been killed under Amin's rule. "For sheer personal callousness and bitterness, it's an appalling record and it's a disgrace on us all that he was allowed to stay in office for as long as he did," Lord Owen said. Human rights groups and Ugandan government officials have expressed disappointment that Amin never faced trial for his alleged crimes. Although the Ugandan Government had said Amin's body would be allowed back to the country for burial, one of Amin's sons has said the former dictator has been buried in Saudi Arabia. "He is buried. The family decided and we have buried him in Jeddah," Ali Amin told Reuters news agency. The son of a self-proclaimed sorceress, Amin had little formal education and joined Uganda's British-led colonial army as a young man. He was appointed head of the army and navy under President Milton Obote in 1966, but overthrew Mr Obote five years later and declared himself president for life. The eight-year rule which followed was characterised by bizarre and brutal behaviour. A Muslim, Amin took five wives, fathered dozens of children and insisted on being called "Big Daddy". 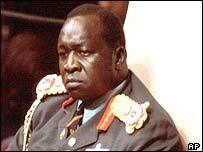 In 1972 he expelled the entire Asian population of Uganda, blaming them for controlling the economy for their own ends. Amin murdered hundreds of thousands of real and perceived opponents during his rule, reportedly feasting on the bodies of some of his victims and throwing corpses to crocodiles. Ugandan presidential adviser John Nagenda told BBC World that it would have been a "good thing" to have put him on trial, but that many Ugandans who suffered through his rule would have a feeling of closure with his death. George Ngwa, a spokesman for Amnesty International said Amin's death was "a sad comment on the international community's inability to hold leaders accountable for gross human rights abuses". The UK Anglican Bishop of Birmingham, the Right Reverend Dr John Sentamu, who was beaten up on Amin's orders before fleeing Uganda in 1974, said the former dictator should have been extradited to Uganda to ask his victims for forgiveness. As Amin consolidated his rule, Uganda plunged into economic chaos as a result of mass expulsions, gross mismanagement and rampant corruption. The United States cut off aid to Uganda in 1972 in protest at Amin's policies, which former US President Jimmy Carter said "disgusted the entire civilised world". In 1976, Amin apparently colluded with a Palestinian group which hijacked an Air France jet and held its Israeli passengers hostage at Entebbe Airport. Israeli commandos rescued all but one of the hostages in a daring raid under the cover of darkness and flew them back to Israel. Amin repeatedly sent his troops to invade neighbouring Tanzania, and in 1979, Tanzanian troops and Ugandan exiles counter-attacked, sending Amin into exile. Amin fled to Libya, then Iraq, before finally settling in Saudi Arabia, where he was allowed to remain provided he stayed out of politics. 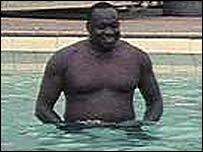 "Idi Amin cultivated a flamboyant and often bizarre style of leadership"